This weekend my girlfriend visited from NJ bringing me 4 sets of book shelves from IKEA, her circular saw and portable router. Together we constructed the 4 bookshelves then made a moveable work table using 3 unused kitchen cabinets, plywood, heavy duty castors and a sheet of birch ply for the top. When I have varnished the table top I will post a pic. 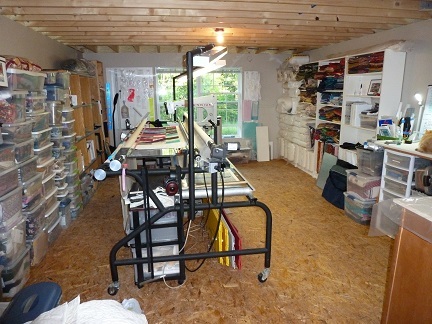 Meanwhile here is a view of the studio with fabric still to be organized. Not sure why only the Kaffe Fassett stash got sorted so far? Oooops. Had to go back and delete pics from earlier post. Wow, Anne! Send your friend to me!!! Just kidding, looks great!! Super studio! Looks pretty exciting. What a wonderful friend you have! I love your studio. Good luck with all your future projects including the design work in your studio. She's the only person I allow to use my Millie. We decided if she lived any nearer we would be dangerous. She has the serious equipment and I provided the drill and food! Looks super organized! You have a very good friend!!!!! Nice!!! Looks like a great place to spend sewing!!! Does she live near Pennsylvania??? I could use a redo on my quilting room. Looks great so far.